As some of you may know, today is my 30th birthday. I’m going back and forth between not thinking about this new decade and trying to figure out how I’m going to not trust anyone over 30 if I’m now included in that bracket. Last weekend, my parents came in for a visit to celebrate a little early. As I mentioned in a recent Photo Diary, we went to New Paltz on Saturday and while I originally thought we might come back closer to home for a mid-day dinner, I changed my mind and decided to head over to New Paltz’s Gilded Otter. Both a restaurant and a brewery, I decided to start off with their beer sample which not surprisingly lead me to order their India Pale Ale to go along with my meal of Stout Braised Boneless Short Ribs. I haven’t had shortribs too often, but have always liked their juicy tenderness. 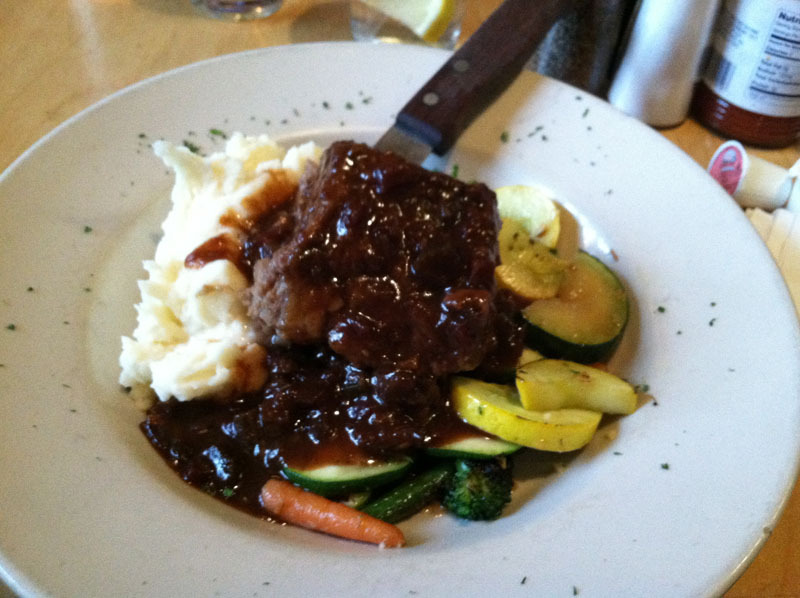 The meal was served with veggies and some super fluffy, bite-y Horseradish Mashed Potatoes. I scarfed this all done pretty quickly, so it must have been good. 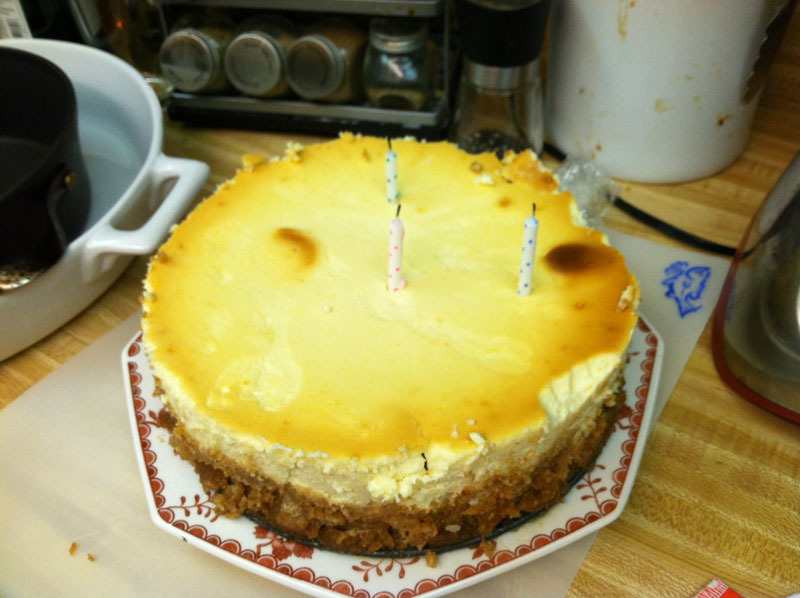 For dessert, my lovely wife Emily made Michael Ruhlman’s Classic New York Cheesecake from Ruhlman’s Twenty (page 113). She wasn’t super thrilled with some of the vagueness in the recipe, but I thought the results were a real treat. More lemony than I would have expected, the mixture of acid and creamy cheese with the best graham cracker crust I’ve ever had made this aces in my book. I should say, I’m not much of a dessert fan, but I do love cheesecake and even had two pieces of this on Saturday. That cheesecake was frickin’ awesome!! I too had 2 pieces on Sat. then graciously accepted the offer to take a piece home on Sunday which I salivated about everytime I thought about it as we drove home. Mom thought I sped home so fast so we could catch the Super Bowl – I was really speeding to get home so I could eat the cheesecake!